The Fondo Colonial is one of the most important archival collections in North America. It contains records pertaining to the history of the people of Spain, Mexico and the southwestern United States, and the many indigenous nations of the region. The documents provide significant insight into the political, economic, social and cultural environments of a vast region, from Durango to Nuevo Mexico, and from Coahuila to Sonora. The documents in the Gobierno y Administración section reflect the inner workings of the Spanish colonial system, and include a wide-range of documents on the governance of several communities of the north of Nueva España. The Gobierno y Administración section includes documents on mines and the granting of mines, petitions and disputes, labor and slavery, censuses and inventories, and the issuance and implementation of royal orders. The Milicia y Guerra section contains an array of documents pertaining to the military defense of several Nueva Viscaya communities, the respective struggles of the indigenous and non-indigenous in war and peace, and the diverse groups of people who lived and worked in or near the many presidial communities of Nueva Viscaya. 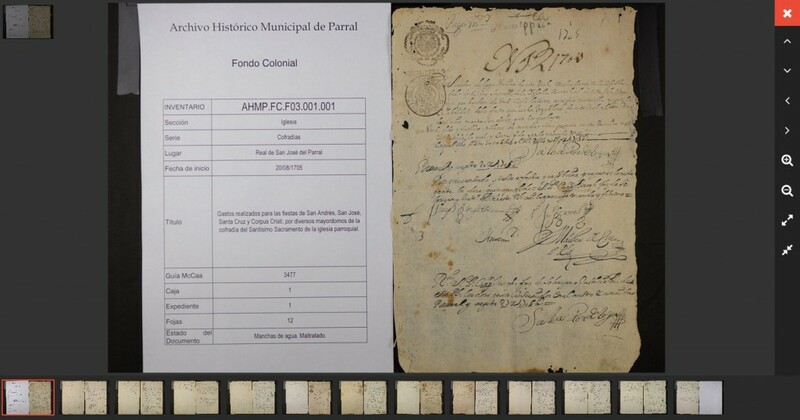 The Hacienda and Tesorería section includes many types of transactional and accounting records that reflect various economic activities and the economic relations between and amongst people. The Fondo Colonial collection consists of browseable digital images from 17th to 19th century archive records. All items in this collection and descriptions are written in Spanish. Items can be browsed by Section and then by Series. Once you choose the Section and Series you are interested in, you will see a list of documents described by inventory number, location, start date, and title. Click on the Inventory Number to view that digitized document. Please note: Presently, all of the sections of the collection have been imaged and are online, with the exception of the Justicia section. The Justicia section, which comprises two-thirds of the collection, will be imaged and gradually added to the online collection. Please check back. RootsPoint is proud to be a sponsor of the Fondo Colonial collection. Your donation to the Hispanic Heritage Project ensures that more records are digitized and made available to the public for free. To learn more about becoming a donor, please see the Hispanic Heritage Project website. This project is the result of the efforts of many people, including Dr. Cruz Lopez, historian and Parral journalist José G. Rocha and Guillermo Gallardo. Rocha and Gallardo compiled the first index in the late 1930s. In 1959, Dr. Charles Di Peso began microfilming the collection and a newer guide was created. In 1984, after additional documents were found, Hector Arras, the Archivo General de la Nación, the Tinker Foundation of New York, the University of Minnesota, and Dr. Cheryl Martin of the University of Texas El Paso supported the creation of the “Nueva Guía” by Dr. Robert McCaa, Carolyn Roy, and Rosamaría Arroyo Duarte. It was then that the Hispanic Heritage Project, which was then a part of the Friends of the Escondido Public Library, provided the final financial assistance to complete the Nueva Guía. In 2007, under the guidance of Instituro Nacional de Antropología e Historia, Blanca Jennyra Figueroa completed the present catalog of the collection. Now under the leadership of Roberto Baca, the current director of the Parral Archive, and with the support of the Hispanic Heritage Project and RootsPoint, the Fondo Colonial collection is now available online.